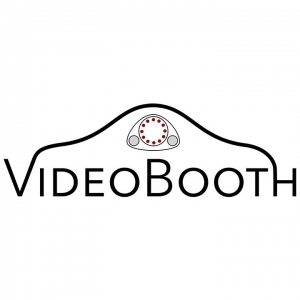 VideoBooth – Corporate or Public? …Both! A lot of potential clients ask us “Do you specialize in corporate or public events?” and our answer is always “Yes!” How? Well, lets dive into that by using two of our recent events as examples. 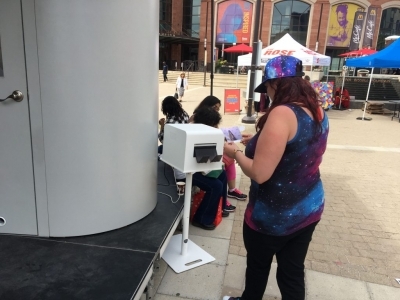 Brampton – one of the Greater Toronto Area’s most colourful and diverse cities – activated “CeleBrampton”, a street festival welcoming local friends and family out for an afternoon of good food, live music, and joyous celebration. The City of Brampton was also looking to capture candid stories from their community for use in later promotional material. Unfortunately they had two major hurdles to overcome - footprint and budget. 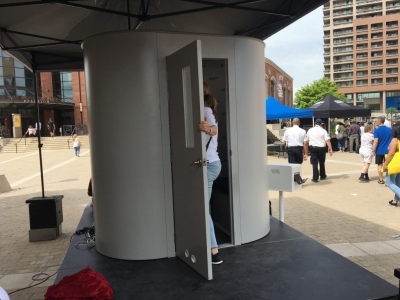 What we were able to offer The City of Brampton was a portable, enclosed video recording studio with a user interface custom branded and tailored to exceed their expectations. To help keep costs within budget range, they opted to only brand the user interface, leaving the booth a classic grey. The attendees were able to record a video and then take a branded souvenir photo home to remember the event! 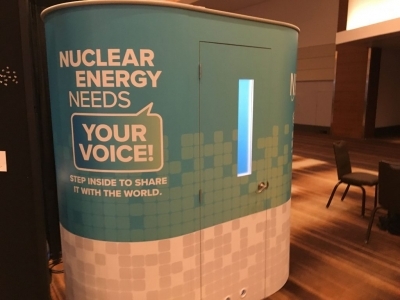 The Nuclear Energy Assembly is an event hosted by the NEI every year; it brings together the best and brightest of the industry, giving members young and old avenues to the leaders of the industry. A major effort of the event this year was to connect the young members with the industry veterans – which is where VideoBooth comes in! 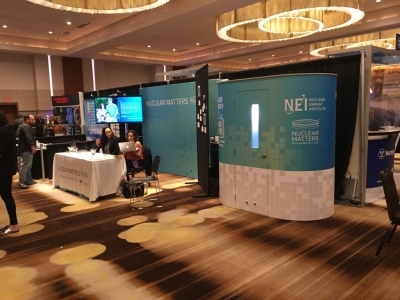 NEI spared no expense designing and branding their VideoBooth, encouraging young members to leave thoughts and questions as well as industry vets to leave advice and inspiration. Activated in their “WiFi Lounge” it was the perfect location encourage participation while eating lunch or letting electronics charge. Regardless of your activation, if you are looking for gathering candid testimonials, creating an engaging experience, and driving organic social presence look no further than VideoBooth Inc.